In the second of a three-volume work, Seta B. Dadoyan explores the Armenian condition from the 970s to the end of the fourteenth century. This period marked the gradual loss of semi-autonomy on the traditional mainland and the rise of Armenian power of diverging patterns in southeastern Asia Minor, north Syria, Cilicia, and Egypt. Dadoyan's premise is that if Armenians and Armenia have always been located in the Middle East and the Islamic world, then their history is also a natural part of that region and its peoples. She observes that the Armenian experience has been too complicated to be defined by simplistic constructs centered on the idea of a heroic, yet victimized nation. She notes that a certain politics of historical writing, supported by a culture of authority, has focused sharply on episodes and, in particular, on the genocide. For her sources, Dadoyan has used all available and relevant (primary and secondary) Armenian sources, as well as primary Arab texts and sources. 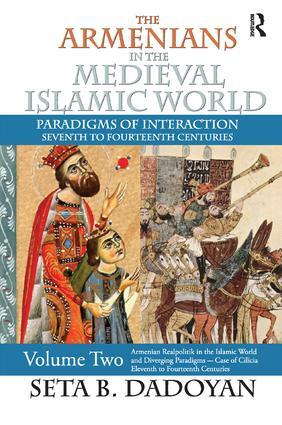 This book will stimulate re-evaluation of the period, and re-conceptualizing Armenian and Middle Eastern histories.